Teaching about native Firewise plants by playing a game show. For the second time this year, HWMO’s Pablo Beimler was invited by STEM teacher, Jamiel Saez, to teach students about wildfires at Kamaile Academy in Waiʻanae. Wildfire was fresh on the minds of many of the students after a busy wildfire year in West Oʻahu. Students ranging from 7th to 9th grade learned the importance of understanding the fire triangle to solve our wildfire issues. By focusing on “fuels,” Pablo taught students that they could make an impact by planting native plants around their homes and in and around the school. Native Firewise plants can significantly reduce the fire threat around structures, an eye-opener for many of the students. Students play fire tag to learn about the fire cycle with a fitting fire-prone landscape as the backdrop. 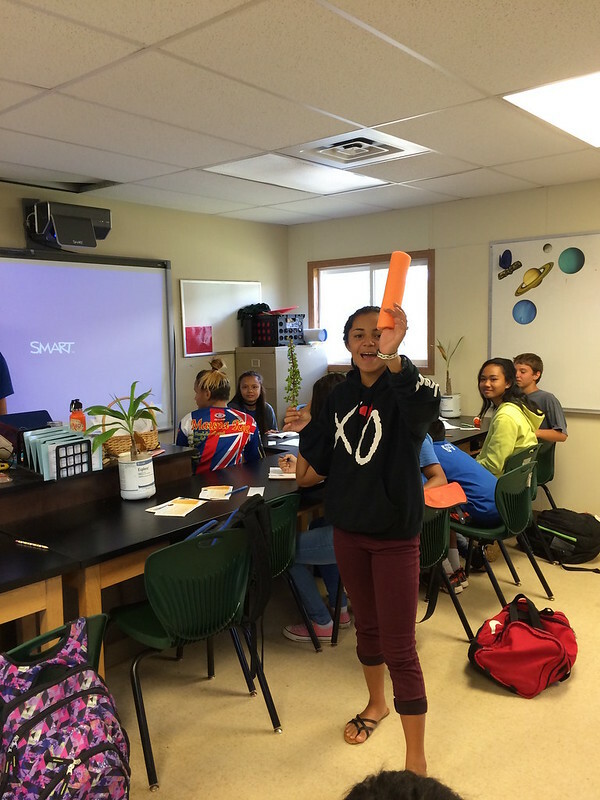 At the end of each class, students participated in the Firewise Plant Game Show. Three judges were chosen to be Pablo’s “landscaping apprentices” and were there to give the final say on whether a selected plant would be worthy of being in our Firewise garden or not. A “plant model” would walk a sample of a plant around to each student in the classroom. After the plant model walked around and students made their observations, “audience members” raised either a happy face emoji, sad face emoji, or “meh” face emoji of their own creation. Their mission: to influence the decisions of the judges who had to make a quick decision based on consensus. One of the classes also had the opportunity to play fire tag outside, learning the fire cycle and its impacts on the native forests of Hawaiʻi. As a special treat, Pablo performed a slam poetry piece for the students - a nice incentive for being a well-behaved class.